Brick Cottage Lane 2 is a versatile quilt pattern that looks great in many fabric collections! Sweet pastels or bold, masculine prints are perfect for Brick Cottage Lane 2! The queen size is square, so the bricks can be oriented both vertically or horizontally. For all other quilt sizes, the bricks are oriented vertically. The instructions include strip piecing and traditional piecing methods, and fabric requirements for scraps and yardage are included. See the picture above for fabric requirements. Brick Cottage Lane 2 is suitable for advanced beginners and up. 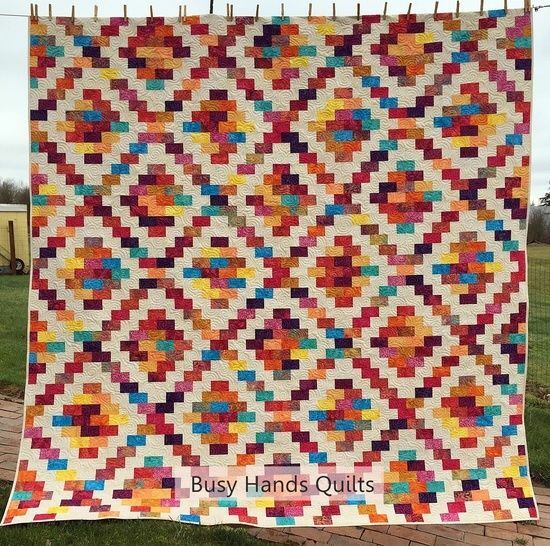 It has easy-to-follow, step-by-step instructions for cutting and piecing this stunning quilt. Baby 46" x 49" Lap 58" x 70" Twin 74" x 91" Queen 98" x 98" King 106" x 98"
This quilt pattern includes 12 pages. Please see the images for Fabric Requirements. This listing is for the PDF version. After payment, you will be able to download the pattern. Pattern #BHQ0716012 Original pattern by Busy Hands Quilts Copyright © 2016 All rights reserved. May not be copied, resold, or shared. I'd love to post pictures of your quilt made from this pattern on my blog, http://busyhandsquilts.blogspot.com. Please message me your quilt picture and any details you'd like me to include, and I'll post it on my blog!